This Brooklyn born right hander took 27 years to make his big league debut with the New York Highlanders and unfortunately, it happened during the worst season in the franchise’s history. Joe Lake had caught everyone’s attention when in his first-ever season of minor league ball in 1907, he won 25 games for the Eastern League’s Jersey City Skeeters. That same year’s Highlander team had finished with a mediocre 70-78 record. New York’s manager, Clark Griffith knew he had to find some younger arms because his top two starters, 33-year-old Jack Chesbro and 34-year-old Al Orth were both getting a bit long in the tooth. He had received a scouting report praising a hard-throwing young right-hander named Walter Johnson, but the kid had only pitched on sandlots and for company-sponsored semi-pro teams. This lack of experience caused Griffith to hesitate reaching out to Johnson and by the time he did, the Senators had already signed the future Hall of Famer. So the Highlanders went and got today’s Pinstripe Birthday Celebrant instead and Griffith put him in his 1908 starting rotation. It looked like a genius move when both Lake and the team got off to a quick start that season. New York was actually on top of the AL standings with a 20-15 record on June 1st. They then lost 12 of their next 16 games and after arguing with the front-office over the team’s reversal of fortune, a frustrated Griffith was let go and replaced by Yankee starting shortstop, Kid Elberfield. The “Tabasco Kid” proved to be a much better player than he was a manager. He skippered the team to a dismal 27-71 record and a last-place finish. Every Highlander starter ended the year with a losing record including Lake, who at 9-22 led the league in losses. 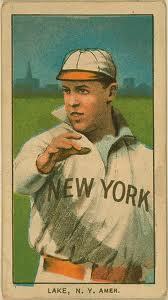 Still, when the team’s 1909 spring training camp opened, new manager George Stallings told the New York press that Lake figured prominently in his pitching plans for the upcoming season. It was a wise move on the part of Stallings. Lake already had a decent fastball and Chesbro had helped him improve his knuckleball. The second-year hurler used both pitches efficiently enough to fashion a noteworthy 14-11 record in ’09 with an outstanding ERA of just 1.88. But instead of keeping Lake, the Highlanders traded him to the Browns in December of that year for a 37-year-old veteran catcher named Lou Criger, who would end up hitting just .188 for New York in 1910. Lake went on to do some very good pitching for some very bad St. Louis ballclubs the next two seasons before ending his big league career as a Tiger in 1913. He shares his January 6th birthday with this former Yankee starting pitcher, this one-time Yankee shortstop, this former 20-game-winning pitcher and this former Yankee reliever. In 1950, long before the two Major Leagues expanded to their current day six-division, thirty-team format, there were only 16 ball clubs competing for just two postseason berths. In the AL that season, the Yankees found themselves in a tight race for that year’s flag with Detroit, Boston and Cleveland. By mid-June it was Detroit who stood in first place with a game and a half lead over the Bronx Bombers. Casey Stengel had one of baseball’s best starting rotations that year but New York’s bullpen had fallen into disarray as both closer Joe Page and Fred Sanford, the team’s best right-handed reliever were experiencing mediocre seasons. In an effort to shore up the team’s relief corps, GM George Weiss acquired two pitchers from the St. Louis Browns. One of them was a left hander named Joe Ostrowski who would not contribute much during his first half-season in pinstripes but would pitch very well out of Stengel’s bullpen in 1951. The second reliever Weiss got from the Browns was a 35-year-old veteran named Tom Ferrick. This native New Yorker had made his big league debut with the Philadelphia A’s in 1941. His career was interrupted by military service in WWII and since his return from that service, he’d pretty much been living out of his suitcase. The Yankees were to be his fifth different team in five years. Ferrick’s pinstriped career began with two scoreless appearances but in his next three, he was hit hard and often. He then pitched four innings against the Senators in a July 4th contest and got the save. That began a hot streak for Ferrick that would last two solid months during which he would win seven straight decisions and save seven more. By the end of August, the Yankees had grabbed a two game lead over the second place Tigers. They would go on to win their second straight pennant and successfully defend their World Championship. Tom Ferrick played a huge role in both. He won eight games during his first half-season as a Yankee and saved nine more. He was also the winning pitcher in Game 3 of New York’s four–game sweep of the Phillies in the 1950 World Series. 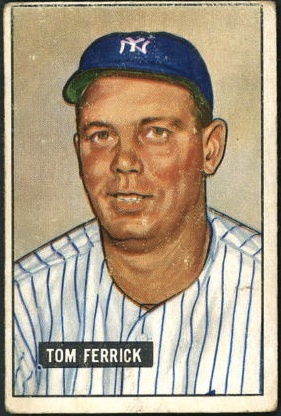 Though he would only pitch in eight games for the Yanks the following year, Ferrick would play a valuable role in the team’s third straight pennant and third consecutive world championship. That’s because the Yankees used him in a trade with Washington that brought reliever Bob Kuzava to New York. Kuzava would go on to duplicate the eight second half victories Ferrick gave the Yankees a year earlier and then save the sixth and final game of the 1951 World Series. Ferrick shares his January 6th birthday with this former Yankee starting pitcher, this one-time Yankee shortstop, this long-ago Highlander starter and another former New York bullpen pitcher. The 1965 season was a “year of discovery” for the Yankee front office and Yankee fans but what they discovered wasn’t pretty. They went into that season thinking the defending AL Champion Bronx Bombers had everything in place on-the-field to win the team’s sixth straight pennant and ended the year realizing their cupboard was bare. The problems started at the top with GM Ralph Houk. He had proved himself as a solid field manager but he was no George Weiss when it came to general managing. The team’s first-year field skipper, Johnny Keane found out that the veteran Yankee roster did not respond to his “disciplined” approach in the dugout or in the clubhouse. Whitey Ford was near the end of the line and the futures of one-time young stud pitchers Jim Bouton and Al Downing did not look so bright anymore. At first base, an immature Joe Pepitone was proving he’d never be a player the team could depend upon. Behind the plate, Elston Howard was breaking down physically. In the outfield, both Mickey Mantle and Roger Maris had awful seasons in ’65. And most shocking of all, the middle of New York’s infield, for decades the core of Yankee dynasty teams, was about to disappear entirely. Shortstop Tony Kubek had gone to the Mayo Clinic to try and find out the true source of the excruciating pain he constantly felt in his shoulder. The diagnosis was not good. It was a vertebrae problem at the base of Kubek’s neck that could not be resolved. The doctors recommended complete rest and the 29-year-old Kubek went one step beyond and completely retired from the game. His second base partner, Bobby Richardson, also just 29-years-old, was also ready to hang up his cleats after the ’65 season but agreed to play one more year to help break in his own and Kubek’s successors. Finding Kubek’s successor would prove to be Houk’s most pressing and difficult challenge. The Yankees backup shortstop was actually more of a natural second baseman by the name of Phil Linz. Linz had gained fame for his harmonica playing on the Yankee team bus during the 1964 season. The guy wore glasses and looked almost professorial but he was actually a pretty wild party animal who hung around with the even crazier Pepitone. Linz also couldn’t hit at all. Houk liked the Yankee’s top minor league shortstop at the time, a kid from Oklahoma named Bobby Murcer, but the GM knew he couldn’t depend on a rookie, so he looked around the big leagues to find out what veteran shortstops were available. Not many were. The one Houk settled on had been the NL Gold Glove winner at the position in 1964, with the Phillies. His name was Ruben Amaro. That ’64 season in Philadelphia had been the highlight of Amaro’s career but the truth was his lifetime average (.241) was five points lower than Linz’s at the time. Houk settled on Amaro because he was a better defensive player than Linz and a much more mature individual as well. When Philadelphia was willing to accept Linz in exchange for Amaro, Houk made the trade. The 1966 season turned out to be one of the all-time worst years in Yankee franchise history. Amaro’s contribution to that season pretty much ended after just four games. In the first inning of the Yankee’s fifth game of the season versus Baltimore, the Orioles’ Curt Blefary hit a popup off of Al Downing into short left field. Amaro went back and Yankee left-fielder Tom Tresh charged in. The collision tore all the ligaments in the shortstop’s left knee and he wouldn’t play his next Yankee game until September 6th. By then the Yankee record was 62-80 and the team would finish the year in the AL basement. 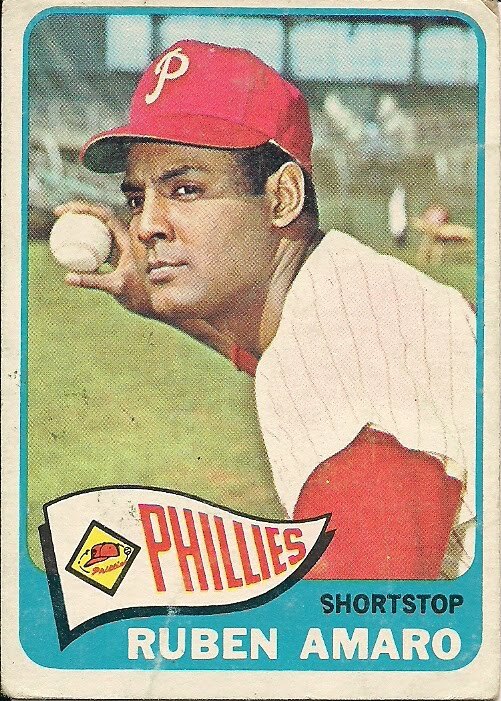 Amaro came back to play 123 games at short for New York in 1967. Just as Houk expected, he showed a pretty good glove, was a positive influence in the rapidly changing Yankee clubhouse but no help offensively to a lineup that was desperate for assistance. Amaro had hit just .223 and scored only 31 runs. Murcer had already proven he was not a shortstop and Houk’s 1966 experiment to play third baseman Clete Boyer at short had failed as well. Instead Houk went searching for a trade. He tried to get Maury Wills and Luis Aparicio but fell short in both pursuits. All he could come up with was a guy named Gene Michael who, ironically would turn out to be a much better evaluator of player talent for the New York Yankees than Ralph Houk would ever be. Amaro ended up getting sold to the Angels. Ruben is also the father of the very talented GM of the Philadelphia Phillies, Ruben Amaro Jr. The elder Amaro shares his January 6th birthday with this former Yankee pitcher who played his best ball for the Cincinnati Reds, this other former Yankee pitcher who played his best ball for the Brooklyn Dodgers, this long-ago Highlander starting pitcher and this former reliever. No this is not a misprint. The same Ralph Branca who was a twenty-game winner and mainstay of those Boys of Summer Brooklyn Dodger teams of the late forties and early fifties and the same Ralph Branca who gave up Bobby Thomson’s shot heard round the world in 1951, was once a Yankee. It happened after the Dodgers put the Mount Vernon, NY native on waivers during the 1953 season and after the Detroit Tigers did the same, the following season. 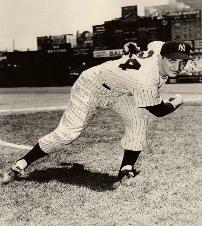 The Yankees then signed the right-hander nicknamed “Hawk” to a contract and he made five appearances including three starts in pinstripes during the second half of the 1954 season. He won his only decision as a Yankee against the Red Sox. That turned out to be the eighty-eighth and final victory of Branca’s big league career. Ralph was born on this date in 1926 This former Yankee pitcher, this one-time Yankee shortstop, this long-ago Highlander starter and this other reliever were also born on January 6th. 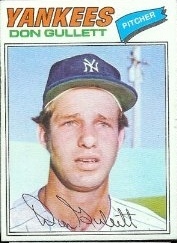 Don Gullett was just nineteen years old when he made his Major League debut in 1970 as a relief pitcher for Cincinnati. The Lynn, Kentucky native struck out Willie Mays to end his first inning of work in the big leagues. He got his first win a few days later when Reds ace Jim Maloney tore his achilles tendon in a game against the Dodgers and Gullett was called in to replace him. Willie Stargell called the hard-throwing rookie’s stuff “wall-to-wall heat” and for the next seven seasons, this left-hander was one of the most dominating pitchers in the National League and became the ace of the Big Red Machine’s pitching staff. After Cincinnati swept the Yankees in the 1976 World Series, Gullett became one of George Steinbrenner’s earliest free-agent acquisitions. He paid immediate dividends, going 14-4 for the 1977 World Championship Yankee team. The following year he won four of his first six decisions before a sore arm shut him down. The diagnosis was a double tear of the rotator cuff in his left shoulder. He worked like crazy to rehab the damage but never again pitched in the big leagues. His nine-year career resulted in 109 lifetime victories and an amazing .686 winning percentage. Gullett shares his January 6th birthday with this long-ago Highlander starting hurler, this former Yankee shortstop, this former reliever and this one-time Yankee pitcher who was better known for his days as a Brooklyn Dodger.